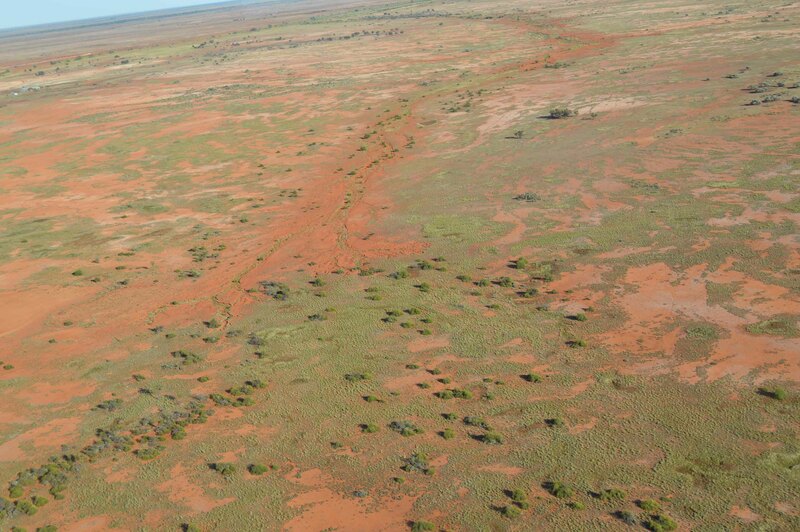 The internationally renowned NSW Soil Conservation Service led the world in innovative rangeland rehabilitation. It is now part of NSW Local Land Services as is the wont of State Governments to restructure and rename. Hugh Pringle has been contracted by Local Land Services Western to take on major projects in the far west of the state. See photos 1 - 3 below. "This has been a wonderful opportunity for reciprocal learning as EMU focuses on saving threatened country and the Local Land Services (LLSW) focuses on “bang for the buck” restoration work. We are now integrating these approaches so that we stabilise gully heads in healthy watercourses and spread and infiltrate valley-side inflows in our works west of White Cliffs. I was always a sceptic about repairing severely degraded land based on the lack of soil in the Murchison region of WA. But here in far NW NSW, you scratch the soil and it grows plants!" "Once again, EMU holds true to its ecosystem understanding approach, but is also very keen to learn new options from others! I am also taking LLSW ideas back to Namibia to add value to our work." Photo 1: A drain to take water off the main access road actually brings water to the road, has exacerbated a lateral gully head and started one of its own! Photo 2: Carefully located earthworks to harvest local rainfall and then spread excess water away from gullies (Local Land Services work). 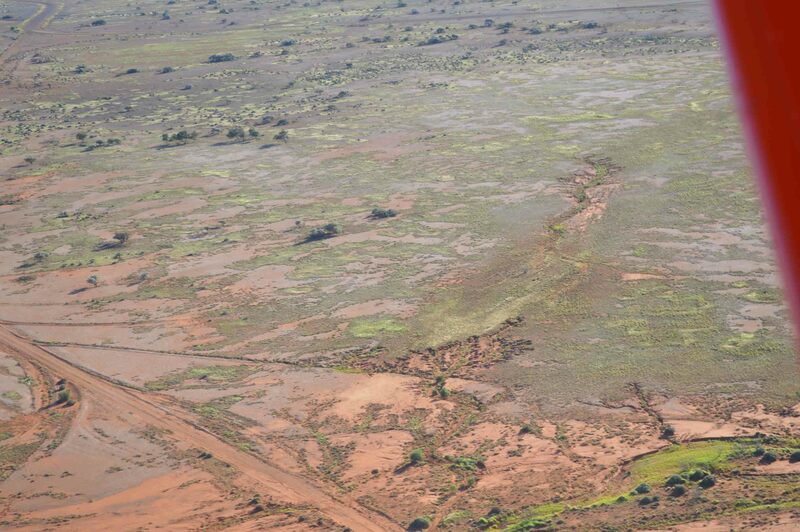 Photo 3: A beautiful gilgai alluvial plain being “eaten” by an aggressive gully head. We will stop it and rejuvenate the dehydrated wetland features below. 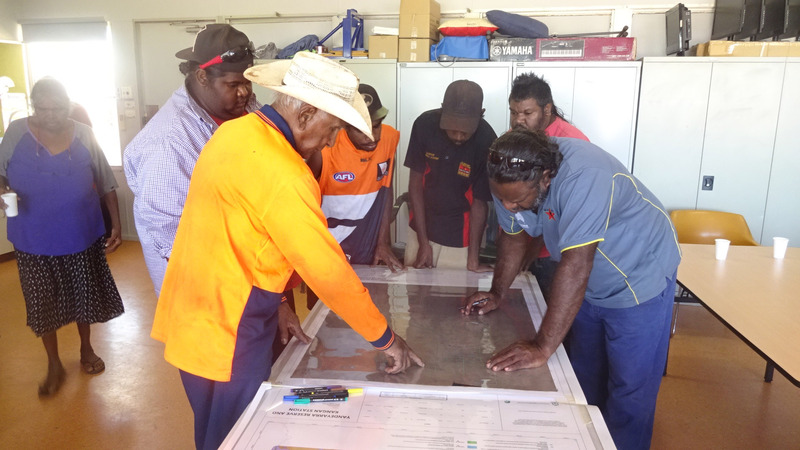 In November 2016 Hugh Pringle, in partnership with Greening Australia, led EMU workshops for the Aboriginal community at Yandeyarra and Kangan Station in the Pilbara WA (photos below). Following the Pilbara workshop Hugh ran three two-day courses on rangeland functioning and rehydration near Yalgoo, Shark Bay and Mt Augustus in WA. Daytime temperatures in these areas was throughout this period above 40 degrees! However, this didn’t dim the enthusiastic participation and the workshops went really well with follow-up activities on the drawing board. Both these sets of work were part of a Greening Australia project funded through the State NRM grant rounds, and facilitated by Greening Australia. 2000-2007 Gascoyne/Murchison Western Australia – 56 pastoral stations experienced EMU workshops and follow-ups. 2006 Bush Heritage Australia - EMU principles were used in Western Australia and are infused in some of BHA processes now. 2009 South Australia - numerous projects in the Marla Oodnadatta, Kingoonya, North Flinders and Middleback Ranges areas. 2010-2011 Central Lands Council (CLC) NT Australia. 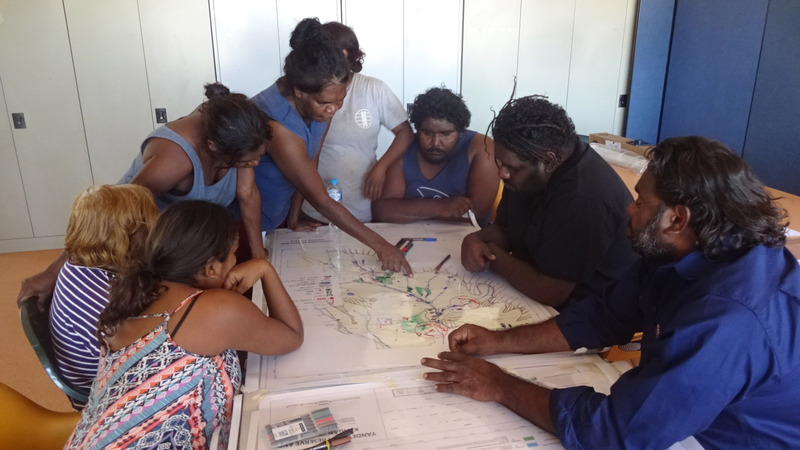 Two Aboriginal Land Trusts were pilots to adapt EMU to Anmatyerr and Arrente culture and then a CLC “EMU trainee” successfully used the adapted process on another Aboriginal Land Trust. 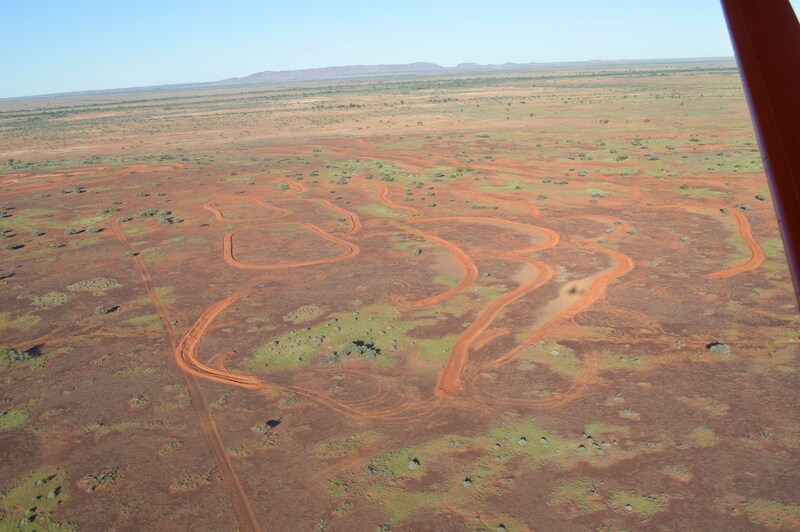 2012 APY - EMU is being used to reverse the degradation of general landscapes and protect special cultural sites within a matrix where Traditional Owners will choose where pastoralism is allowed on their land. 2013 Namibia - The German Government has funded a four year program to research key EMU “geomorphic ecology” ideas and develop multi-media materials to support a diverse range of landholders and tribal cultures. 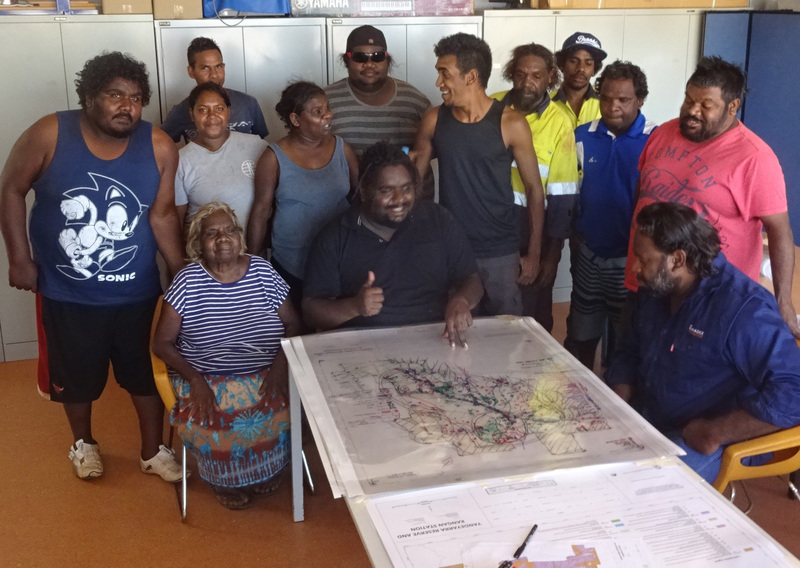 2013 Carpentaria Land Council Aboriginal Corporation - EMU currently working on an iconic deltaic wetland with Traditional Owners and the Gangalidda and Garawa Rangers with proposals to expand the initiative to other lands. We are fortunate to have recently had Dr Ken Tinley volunteer his time on Edgbaston to give advice on measures to repair & restore problematic aspects of the catchment’s run off. Ken spent a lifetime working in African game parks as a ranger and ecologist. In Australia, along with Dr Hugh Pringle he developed the Ecological Management Understanding (EMU) philosophy and methodology that Bush Heritage has implemented on our Charles Darwin and Eurardy reserves in Western Australia. At Edgbaston Ken quickly took in and mapped the lay of the land. He then provided us with practical and cost efficient solutions to deal with the catchment run-off that has been affecting a spring critically important to the red-fin’s survival. We’re now in the process of implementing his advice (work that is enabled by generous donations from our supporter's). In the early 1970’s brothers Dave and John Varty established a wildlife conservancy on their family farm that borders on Kruger National Park, South Africa. The following is from Dave’s book The Full Circle published in 2008. “Like turning the pages of a book, Ken laid the story before our eyes. He told us exactly how, over the past century, man had damaged the natural environment. Man had brought in cattle, had built roads and even a railway line. Many of the roads and tracks and even fire-breaks acted like funnels accelerating the run-off of rainwater because they were built straight down hillsides or on the seeplines. We had also come in on the back-end of a cattle ranching operation and much of the topsoil had been compacted by cattle, particularly at water points. The explosion in the wildebeest population and the confinement of many thousands of these animals within Sabi Sand when the fence was closed in 1964, also exacerbated the problem. The result was that instead of rainwater soaking into the ground, it ran off, and where the natural ground cover had disappeared, it took topsoil with it. When the water table dropped and the land dried out, trees and woody shrubs invaded the grasslands and the wetlands disappeared.